Charles Darwin University has secured funding for Timor-Leste’s Ambassador to the United Nations, Nelson Santos, to undertake an Honours-level research study on his country’s border negotiations with Indonesia. 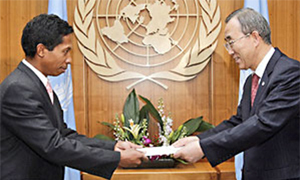 Ambassador Santos was previously secretary-general of Timor’s Ministry of Foreign Affairs and successfully negotiated the border arrangements when Timor-Leste became independent in 2002. He will study at CDU under a $10,000 AusAID Leadership fellowship. Although based in New York, Ambassador Santos frequently returns to his home country, and will come to CDU for brief periods of supervision under Dr Dennis Shoesmith, senior lecturer in politics and history, during the writing of his research paper. On completion of the Honours unit he will be ready to join CDU’s Masters by Research program. Dr Shoesmith said discussions were in the early stages for Timor’s Ministry staff to be enrolled in CDU’s Bachelor of Arts course. ‘The course is currently being developed to include a regional and international studies focus,’ he said. It is expected that arrangements will be discussed with the new Timorese government after the June 30 parliamentary elections. CDU already has close links with the new nation in providing educational services, advice on infrastructure and research.